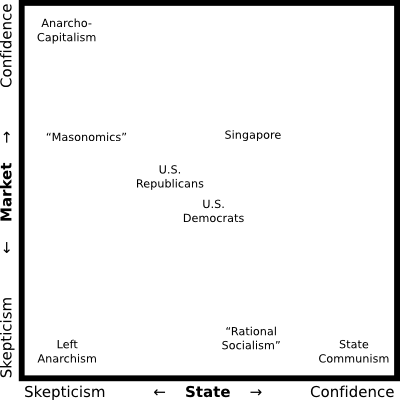 Presumably the prototypical Masonomist on the above spectrum would be far on the left (extremely skeptical of the state) and in the middle (somewhat skeptical of markets), leading such a person to always favor market solutions (the state being a lost cause), with more emphasis on the design of market institutions than someone merely confident in the market and skeptical of the state might. Schools of socialism that roughly mirror Masonomics must exist — “Governments fail. Use government [carefully].” — I just don’t know their names, so I put “rational socialism” on the spectrum. It seems that from many places on the spectrum, one might beneficially increase skepticism of one’s preferred mechanism, so as to focus on making that mechanism work better, and thus “win” more in the long term. Admittedly, this might seem an awful tradeoff for an activist focused on bashing (whatever they see as) evil in the short term. Further, one genuinely interested in improving the world as opposed to making ideological points might focus on improving mechanisms that make criticism and improvement of all mechanisms easier (nothing remotely new about this observation) — these are public goods that facilitate the provision of more public goods. Completely coincidentally (noted while writing this post), David Nolan died today. His name is associated with a fairly well known biaxial political spectrum. Nolan also founded the strategically unsound U.S. Libertarian Party. If it mattered at all, and weren’t in bad taste, I’d suggest it die with him! Only two endorsements this (U.S.) election, mostly because I haven’t been paying very close attention. Most importantly, for California Proposition 19, the Regulate, Control and Tax Cannabis Act of 2010. Stop throwing people in prison over this. Full stop. Sadly no contracts are conditioned on the outcome. Choices in the Oakland (where I’ve lived for almost exactly two years) mayoral race are underwhelming. “V Smoothe” of the excellent A Better Oakland blog (recommended for residents; the only Oakland-centric blog I’ve followed for any length of time … for that matter, the only Oakland-centric news source, not counting a neighborhood mailing list and the only somewhat Oakland-centric East Bay Express) has posted take-downs of leading candidates Rebecca Kaplan (ineffective), Jean Quan (I’d bet on increased probability of bankruptcy), Joe Tuman (ignorant), and is supporting the frontrunner, Don Perata, a leading symbol of corruption in the Bay Area, and a lobbyist for California prison guards, roughly on the grounds that only he can get stuff done and his faults can be explained away. I don’t have much confidence that Perata would “get stuff done” and even lower confidence that whatever he got done would have good outcomes. Given lack of anyone with an obviously stellar, or even realistic, policy portfolio, I’m discounting projected ability (or lack thereof) to “get stuff done” and rationally indulging in an expressive vote, for Kaplan — simultaneously the most unusual, and most stereotypically Oakland, of the leading candidates — lesbian, green (formerly Green), and for marijuana legalization. Oakland has more lesbian couples per capita than any other big city in the U.S. (though Oakland isn’t exactly big) and if Kaplan were elected would as far as I know one of a very few lesbian mayors of significant cities in the U.S. (though way behind the actual big city of Houston), and is known for being a center of environmental activism of both the political and urban homesteading sorts and as Oaksterdam. I have a weak preference for a jurisdiction to accentuate whatever distinguishing characteristics it has, excepting wholly negative ones (e.g., crime, and gross corruption and incompetence). Kaplan will best accentuate (or rather signal; remember this is an expressive vote) the relatively neutral to good qualities of Oakland (yes, the whether is fantastic, and out of mayoral control) and doesn’t seem likely to cause exacerbation its wholly negative qualities.